WASHINGTON (Feb. 20, 2013) -- The Army must transition now from a force of execution to one of preparation, said the commander of the Army's Training and Doctrine Command. 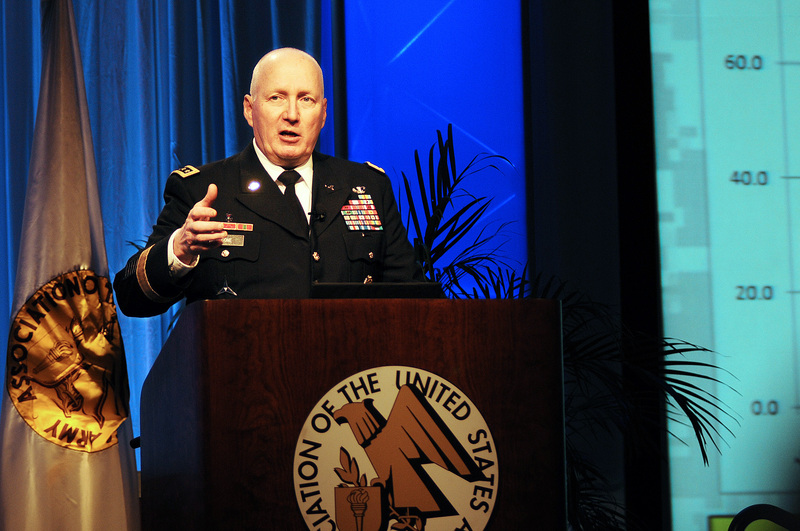 As the opening speaker at the 2013 Association of the United States Army Institute of Land Warfare Symposium and Exposition in Fort Lauderdale, Fla., Gen. Robert W. Cone discussed how the Army must change as it transitions out of Afghanistan during a time of fiscal drawdown for the military. Gen. Robert Cone, commander, Army Training and Doctrine Command, discusses the Army's transition from a focus on execution, to a focus on preparation, during the Feb. 20, 2013, opening of the 2013 Association of the United States Army Institute of Land Warfare Winter Symposium and Exposition in Fort Lauderdale, Fla.
Cone said one thing the Army must do is "invest in the process" of acquisition. He said over the last 12 years, the Army has gotten away from traditional processes for acquisition, and turned instead to rapid acquisition to provide for the needs of Soldiers in theater. Rapid acquisition bypasses the traditional acquisition processes the Army would normally use, and in some cases doesn't pay attention to cost. "The reality of it is, with money being much harder to come by, we are going to have to make fewer, but bigger decisions, and they will have to be informed by process," Cone said. The general also said the Army must start planning for the future. For a dozen years now it has been responding to immediate problems in theater. Now, he said, "the intellectual has to get back out in front of the physical." With the drawdown in Iraq complete, and the drawdown in Afghanistan coming, the Army must shift toward looking at the larger problems it may face in the future, and take an intellectual approach to solving those problems and how to apply resources against them. Finally, Cone said, the Army must be looking for long-term innovations. "An order of magnitude of change and generational capability change," he said. While the Army has enjoyed a "high degree of success" for more than a decade now in theater, Cone said "Big Army" must now shift its focus to the future. So while the Army has become very good at adjusting quickly to changes in both the tactical and operational environment in theater, that's no longer enough. "Strategically, we have been fighting the same fight now for about 12 years," he said. "And I think that as we look to the future we have got to be prepared for both strategic and operational adaptation." Cone acknowledged that the Army has proven its ability over 12 years for conducting counter-insurgency and stability operations from static bases and with a robust support infrastructure in place. "But let's be clear, that is not the full range of military operations," he said. "And again, with a young generation of warfighters, who I think so highly of, I think they would be the first to point out that their experience beyond this COIN/stability operations set is limited." Improving on the experience level of those Soldiers and the Army, and preparing for the future, he said, requires an approach that pays special attention to doctrine, organization, training, materiel, leadership and education, personnel and facilities. The strategic environment continues to be as dangerous now as it was when the Army started in Afghanistan, Cone said. "The world as we know it today is as dangerous and complex as at any time in our past," he said, saying that the effects that can be delivered by non-state actors through the use of technology is "absolutely staggering." Cone said that what the enemy has used against the Army in the past, they will continue to use, and will tie into that even better technology, including unmanned aerial vehicles and the proliferation of nuclear weapons. The general also touched on how the enemy knows to use anti-access and area denial to stymie Army efforts to win. He said war games that have been hosted by TRADOC, as part of its Unified Quest series of events, have illustrated that the enemy recognizes that once the Army is set in a lodgement area, it can project the combat power it needs to win. "The trick from their perspective is to prevent us from ever establishing that sort of lodgement within a theater of operations," he said. Cone said the enemy understands U.S. military strength, it's Navy and Air Force, for instance, and it's intelligence, surveillance, and reconnaissance capability as well as its ability to deliver precision strike. "They will avoid our strengths at all costs," he said. "They will prolong conflict, attacking our national will, and then they will use strategic levers, events on the ground, that will cause us to fight in ways we do not want to fight, and thereby prolonging that conflict into the future. It is dangerous, in my opinion, to undertake combat operations without a fully developed set of capabilities, reflecting air, land and sea." The Army's chief of staff, Gen. Raymond Odierno, has characterized the Army as being in an era of "prevent, shape and win," Cone said. Demonstrating a full range of capabilities is a key component to prevention of conflict, Cone said. When America shows what it is capable of doing, it lets others more accurately assess their desire to engage in conflict. The Army also shapes the strategic environment by working with, training and creating interoperability with coalition partners and indigenous forces. Additionally, Cone said, the Army can currently win the conflicts it engages in, and must maintain that capability in order to be effective with the other two elements. "The reality of our business is that no one stands in line behind us to answer the call of this nation," he said. "The Army will do what others cannot. And we have to maintain that capability. And we are doing that right now under an assumed 490,000 cap, with a capability of 32 combat brigades, 10 divisions, and four corps. "When we lose the ability to win, I'm not so sure our 'prevent' and 'shape' is going to be quite so effective," Cone said. The general said the Army must shift its activities now from one of resourcing the fight in Afghanistan to one of being prepared for future conflict. But making that shift must be done carefully, in order to prevent Soldiers from losing interest in the Army and leaving. Young Soldiers, Cone said, know an Army where "the world is defined by having everything you need to do all the training that you want. If there is a problem it's somebody's job to get it for [you] in terms of making things happen. We are about to cross into an environment where that will change." Soldiers have high expectations of the Army, and Cone said he is concerned that severe cutbacks to things like home-station training, or the ability to conduct exercises, will have a "very serious negative impact on retention in these generations." A challenge for the Army, he said, will be getting the balance between near-term readiness, and the investment in readiness for the future. "Cutting the near-term readiness too greatly is going to create an exodus for us, and a great deal of dissatisfaction," he said. An Army of "preparation" is one that that has shifted the focus to long-term readiness, and to do that the Army must invest in leader development and institutional training programs, Cone said. The 2013 Association of the United States Army Institute of Land Warfare Symposium and Exposition runs Feb. 20-22 in Fort Lauderdale, Fla.